Monday 17th April 2017 will go down in my bass fishing diary and indeed, my own education, as a very important day – a complete game changer in fact. It’s been a very satisfying start to my bass fishing year. An early client managed to catch a beauty late in March, another client had a good fish turn away at his feet (maybe not so good for him perhaps!) and I’ve managed to achieve one of my goals for the season – to catch a bass at night on a white senko. But why is this so important? I have previously caught bass at night on lures – not very many admittedly. And it is something that has generally occurred by mistake almost, either at pre-dawn or post-dusk. Lures such as the very shallow diving Tacklehouse Feedshallow from shallow reefs, and large surface sliders such as the Duel Aile Magnet have accounted for them, mainly from headland marks a few years ago now. But it was Henry Gilbey’s magazine articles and blog posts on the subject of lure fishing at night, with white senkos in particular, that really caught my eye. And once I’d watched the video of the lure being retrieved and effectively ‘waking’ across the surface here I knew that this was something I wanted to attempt. I won’t lie, I was a little sceptical about the whole subject, but lots of very good lure anglers have caught some lovely bass by this method – so it had to work right? NOTE: When I say a viable option, I’m thinking of lure fishing from beaches only when the sea is flat calm and crystal clear for very obvious safety reasons – I don’t even fish off rocks myself at night, as I’ve witnessed a rogue swell in totally benign conditions. Moreover, I completely admit that one fish clearly doesn’t make me an expert in this method, but the fact that I’ve experienced success, and knowing this very simple tactic works will hopefully appeal to my potential clients… In lure fishing terms, it actually couldn’t be any simpler. 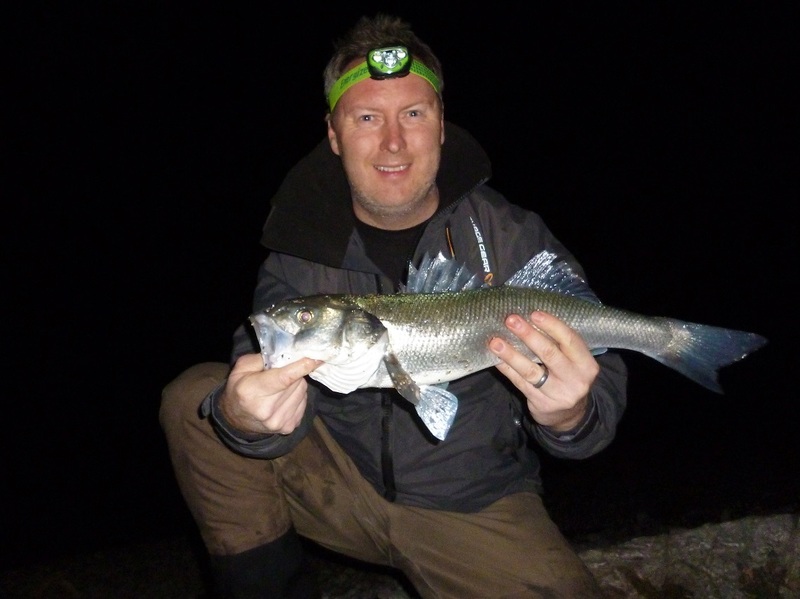 So late last season (December/January) I embarked on a few exploratory night lure fishing sessions (around 25 – 30 hours worth) but apart from one savage hit, I came away from the experience yearning for the time when the bass were back inshore in numbers. Fast forward to late March and early April and with them returning inshore but noticeably ‘finicky’ (due to the water being extremely calm and clear) I decided to recommence with the method. I had earmarked quite a few possible locations during the winter period as areas where I believed bass could be present at night – all of which I’d caught bass from before, if not the excact spot, then at least within the vicinity (nearby rock platforms). My logic was to fish in areas that I knew (from first hand experience) were frequented by bass. Moreover, all of the marks I identified would see me fishing from sand or shingle (small coves and beaches) into shallow water (4 – 8ft deep depending on tide height) over expanses of rock and weed – essentially reef systems. There is particular cove that I have been desperate to fish at night since I was stood (at low tide) on it back on a bloody freezing exploratory day out back in February. I’ve caught bass from the outer edges of it over the years at all stages of the tide and in differing weather conditions – nothing massive (2 – 4lb) but enough to convince me that the area warranted more investigation. Knowing the high water time was 2225 I knew I had plenty of time to make the 10 minute drive and 15 minute walk in order to be fishing by around 1930. Like huge swathes of south Devon, the whole area is overall, very rugged, but interestingly, around this mark there are a lot of sand patches between the rocks – ideal for bass to patrol in or utilise for ambushing purposes – lovely. It was a gorgeous evening, still very bright and sunny (the weather has been amazing lately) and the sea flat calm, and possibly the clearest it can get I think! I was using my Slash Lamya Thief 862ML this evening (this rod has a huge amount of ‘feel’ when using lightly weighted or weightless lures) and within seconds of arriving on the first mark I was attaching an Illex Nitro Sprat for my first cast – gently lobbed into a gully (with a sandy/shingle seabed) very close to the rocks. Wrasse were the intended target here and sure enough, first cast, a definite pluck resulted in the tail being ripped off the lure! (see below)… Those teeth are serious weapons. A couple of casts later and following a few more tentative ‘nibbles’ a more solid hit resulted in the wrasse in the photograph below. I’d previously had a few casts into the ‘designated darkness area’ on the way to the mark above but, importantly, I had purposely left the actual cove/beach/reef to ‘rest’ for a good 30 – 35 minutes and at least 20 minutes into complete darkness before approaching it again. First cast (I cannot emphasise its importance enough) into the cove at 2145 – 40 minutes or so before high water (a neap tide of 4.4m Salcombe scale) and only 10 – 15 yards out a sharp tug (as the lure was brought into ‘life’ at the start of the retrieve) resulted in the rod pulling over. Blimey! was this it? My first bass at night on a white senko? I resisted the urge to turn on the head-torch until I could sense that the fish was on the shingle. Please let it be a bass were my thoughts… but I had my doubts as there was no parallel run or line taken against the fairly loose drag and sure enough, this plump pollack revealed itself in the light. A sharp pull, then nothing… do I stop or keep winding… I decide to keep winding waiting for a solid hit at any split second… Nothing. I start to fan the casts out slightly, working the area then move along the beach slightly and make a cast out into a ‘scour’ or ‘channel’ that I noticed when I stood here on that icy day 2 months ago. A quick check of the photograph of the mark on my phone (I’ve got photographs of Google Map images saved for moments just like this as a reminder of what the ground looks like). A few more casts and a definite tap and short run signals that there are definitely fish moving into the area – but are they bass? Night time is now bass time! A few more hits later at all stages of the retrieve (some very close in where the shingle meets the reef) and I’m just starting to think ‘these are just small pollack pulling the tail end of the lure’ when no more than 5 -7 yards from dry land tap, tap, BANG! This time the fish is well and truly hooked and the rod is pulled down and around to my right – the drag singing as it does so! Yessssssssssss here we go! This is a bass without a doubt I’m thinking now and sure enough, following the obligatory short parallel run the fish beaches itself. The head-torch is flicked on and before me is my prize – a beautiful if rather slender bass with that 6/0 weedless hook neatly placed in the scissors of its mouth. A great deal of any lure angler’s success is down to knowing the marks, what lure to use, where the fish might be and adjusting their tactics to the conditions. Ultimately, it’s confidence in those methods and first hand experience earned through dedication and persistence that enables them to catch fish consistently. Of course, confidence can only be achieved by either witnessing or achieving something yourself, which is why I implore you to try this method for yourself. I don’t think there is any right or wrong way to fish these senkos to be honest – some people retrieve them like surface lures, some are constantly twitching, where as others just straight retrieving them. Others like to insert a rattle into the lure and I imagine many lure anglers will probably swear by another colour such as black? It’s all personal choice at the end of the day, but I’m definitely convinced – I just needed that one bass to gain the confidence. Furthermore, I think a wonderful element to bass lure fishing is that there are just so many ways in which these predators can be targeted. I’m always up for trying out a new method or lure and I think this is important – to always be willing to learn from other people and acknowledge their achievements and methods. One other factor to consider is the fact that it is still only April! Seemingly, there are decent numbers of bass inshore, but I’m pretty excited about the prospects for later in the season when the sea temperature increases and the sandeels arrive! In the 6 – 7 year run up to becoming a guide I would only fish in daylight because I could never imagine a situation where I would be guiding clients in darkness – well I can now say that has been blown completely out of the water! Still think the tail nips re Pollock? Or perhaps smaller bass? Also I still want to k ow if white is a confidence thing that has been passed on……angler to angler via blogs, articles etc. Would this work with any other similar profiled lure in different colours? And will anyone give the others enough chance to compare lol knowing white works. I’m confident that any bass over 1lb will just wolf down a 5″ or 6″ senko. As for colour, it’s a great point you make as having confidence in a lure, for whatever reason, is so important. With more time on my hands this coming season, and with an increased number of confirmed ‘productive’ darkness marks, I will be experimenting with different colours and different lures. Hi there – very well done on the Senko caught Bass. Having spent a small fortune of soft plastics including Savage gear eels, Senkos of all colours and do olives. I have failed miserable. I’m not sure if I get bored using them or that I lack confidence. I have twitched them like I have never twitched before. I switch back to hard plastics then fish onnnnnnnnnnnnnnn, dohhhhh so frustrating. I will continue until I pop my cherry though. I have noted the Tackle house feed-shallow in Ochona wrong spelling I know. I purchased one I like the look of it. I hope it does well around our way. I mainly try a mark were as you say patrolling bass pass by at low water – a slightly undulating sandy beach with rocks either side of it with some sporadic weedy spots. I will move as the tide floods approximaetly three hours onto a rock mark for high tide again more rocky with sporadic weed spots again. I could be wide of the mark (only time will tell considering I’ve only had the one bass at night on these white senkos, but I’m going to concentrate my efforts on flat (ish) areas of reef that run off of sandy or shingle beaches.